These crispy Bread and Butter Pickles are the happy marriage of sweet and tangy flavors with zippy spices. 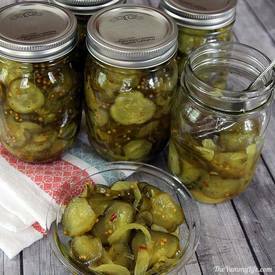 This is my favorite pickle recipe and is tried and true through generations in our family. I've been eating these homemade pickles my entire life. These are surprisingly easy to make. They are especially fast to prep as a refrigerator pickle. If you want them to be shelf stable for an extended time, this recipe is also suitable for canning. As canning recipes go, this is one of the simplest.